Prevent frozen water lines from damaging your sprinkler system by performing this crucial seasonal maintenance. You rely on your sprinklers to keep your lawn looking great most of the year, but when autumn rolls along you need to take some time to empty and insulate them so they’ll be every bit as reliable next spring. If you fail to winterize your sprinkler system properly, when the cold weather hits, any water left in the lines can freeze, expand, and crack, potentially causing costly damage. 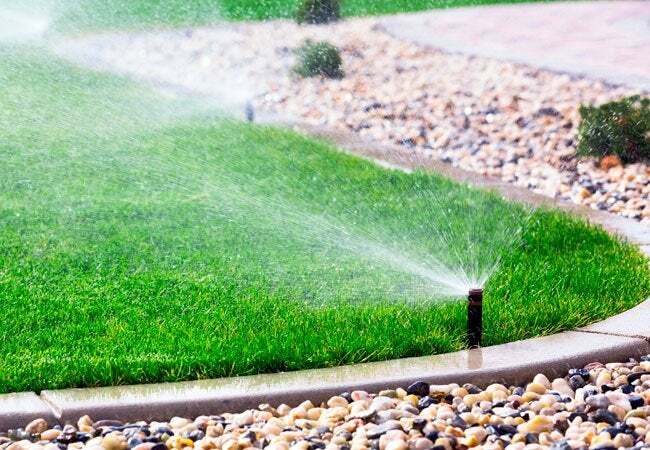 For the various types of sprinkler systems in use today, there are two primary methods of releasing this water: draining it from the valves and/or using an air compressor to blow it out of the irrigation pipes. Because the consequences of leaving even the slightest bit of water behind in your pipes can be dire, sprinkler system manufacturers recommend that homeowners follow both procedures every fall before temperatures dip to 30 degrees Fahrenheit. Depending on the type of drain valve your system utilizes, draining could be truly automatic, or it could be manual, requiring that you pull a few levers to get things moving. One way to tell if your system is manual-draining is if your sprinkler heads have check valves on them. Once you know what type of system you have, you can accomplish almost all the necessary winterization on your own with the information below—though, of course, you should keep your owner’s manual nearby for reference. Even still, it is strongly advised that you not neglect the pro portion of the process: That extra step (which costs a national average of about $85) could save you hundreds in replacement or repair of your sprinkler system later. First, turn off the main water supply, often found near your water meter. If your sprinkler has manual drain valves, also shut off the valves on the backflow preventer. A backflow device, typically located near the water main from which the sprinkler water is drawn, prevents pressurized, potentially contaminated water from mixing with the potable water supply. If you’re not using potable water for irrigation, your system may not include a backflow device, but if it does, turn it off via two valve shut-off handles on the separate pipes feeding into the device. Just turn these rectangular handles clockwise one-quarter to one-half turn; use pliers if the valves are too tight to turn by hand. Your next move depends on the type of drain valve you have. • If your sprinkler system uses an automatic drain valve, this spring-loaded drain valve will open every time the system shuts off because there is little to no water pressure running through the lines to press and close the valves. 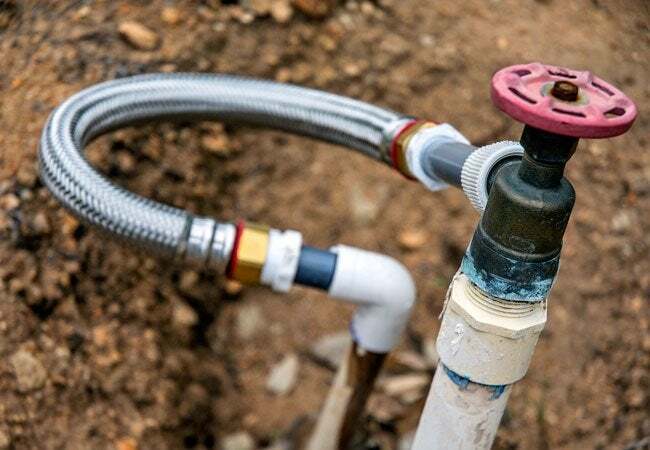 But this draining won’t release water trapped inside the valves themselves, so on each valve of the sprinkler system, locate the solenoid—which typically looks like a PVC cap with wires coming out of it—and loosen it by hand so air can flow inside the system. Once this is done, water should drain out from each zone of the system’s mainline. 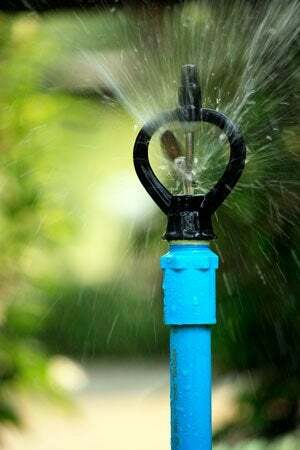 • If your sprinkler system uses manual drain valves, locate the valve at the lowest point on your system’s mainline. Wear protective goggles for this, because the water can be under pressure and it’s possible to open valves before they depressurize. Next, turn off the the sprinkler system’s mainline shut-off valve. Then, open one of the control valves on the system. You may be able to do this from a controller, otherwise it’s a manual valve. Doing this will depressurize the sprinkler system mainline. Finally, slowly open the manual drain valve and allow it to drain fully. Follow this procedure for each manual drain valve on your system’s mainline. When all the water has drained, close each manual drain valve. After emptying the mainline via automatic draining or manual draining, make certain that no water remains around the various valves that could expand when temperatures drop. Depending on your system, you may have a “boiler drain valve” or a “stop and waste valve,” which will turn off the local water supply and also allow for draining that pipe. Locate this valve’s drain cap and open the valve to drain the last of the water left between the irrigation system and the backflow device. If you plan to hire professionals to perform a blow-out, proceed to Step 4; if you’re looking only to drain the pipes, you can proceed to Step 5. Assuming that your sprinklers are relatively new and installed correctly with the irrigation pipes sloping downward toward the valves (where water can release at the lowest point in the system), gravity will guide nearly all the water out after you’ve relieved the pressure in the mainline. But it’s hard to know for certain that there’s not some left behind—say, caught around a dip or curve in a pipe that has shifted since installation. For this reason, experts recommend calling in a professional to take a further precaution that will release any last lingering water remaining in the sprinkler system: blowing out the pipes using an air compressor. Sure, you might own a similar machine to power your nail guns and other air tools; perhaps it even boasts the capability to generate more than the recommended 50 pounds per square inch (PSI) needed to clear a sprinkler system’s worth of flexible polyethylene pipes, or the 80 PSI needed to blow out rigid PVC pipes. Still, experts advise against DIYing this next step for two reasons. First, safety: All kinds of potential injuries can arise in air compressor use, from valve tops blasting off to flying debris. Second, the typical at-home air compressor might generate roughly the same force but not the same volume as the professionals’ machine (a 10 cubic-feet-per-minute compressor). Theirs has the capacity to work more quickly and more thoroughly, whereas homeowners’ equipment can take significantly longer and potentially leave water behind—not a risk anyone should take. After the professionals connect their air compressor to the hose leading from the water main supply and blow out your sprinkler system zone by zone, they should also close the main shut-off valves. They’ll also drain any water that collected around your backflow preventer (the device that isolates the system’s backflow and keeps it safe from damage). Some systems require that valves be stored indoors and pipes capped during the winter. Consult your owner’s manual to find out how to proceed. If storage isn’t necessary, go on to Step 6. If your system—including pipes, backflow preventers, and main shut-off valves—is at all aboveground, it’s advisable to insulate the exposed parts. Your local hardware store should offer foam insulation tape, foam pipe covers, and other winterizing protection. Following package instructions for the foam insulating products, cover exposed pipes and other system parts to protect against freezing or cracking, taking pains not to block valves or drainage ports. If your system is on a timer, shut it off for the season. (Remember to reprogram it in the spring!) It’s also possible that you have a “rain mode,” which stops the sprinklers without turning off the timer when you get precipitation during the regular season. You can turn rain mode on for the winter to prevent the system from watering at all. This way you can avoid shutting the system off and losing the programmed settings, which would leave you with the hassle of reprogramming come spring. The sensor uses such a small amount of energy that leaving it on through the winter won’t add to your energy costs. In the spring, simply turn off the rain mode and watering will resume like clockwork. If you still have another round of watering to do this season, make sure you do it right. Watch our video for some simple but smart tips to make your next watering session more effective.